I eagerly followed the Vogel family on their Pan-American bike ride from Alaska to Argentina. I did not hear about them until they were about half-way through their epic journey. However, as they neared Argentina I was hoping to get a chance to meet them if they chose to do the eastern route of the country and come down through Buenos Aires. They did not. Though I did not meet them while we were both in Argentina, I have gotten to know them a little more personally since then. Mostly I have continued to read their blog posts and interact with them through email. I was excited a couple of weeks ago when I got an email saying that they had a free ebook available called Bicycle Touring with Children: A Guide to Getting Started. This book is written by Nancy Sathre-Vogel (the mother of the family). She helps encourage the reader that it is possible to go on a bike tour with your family. Not only is it possible, but she gives some pretty good arguments as to why you should consider it and why you should consider doing it as soon as possible. You only get one chance to spend these years with your children. Don’t wait until later to do what you want to do now. The years ahead are uncertain and you don’t know if you or your child will be physically able to do a tour at a later date. While you may not agree with all the advice given in the book, you have to remember that this family has done a couple of grand bike tours. As the mother, who has her children’s best interests in mind, Nancy gives great advice that is borne out of experience. I would come closer to trusting her than someone who has written a book purely from research. Even though she has her experience to rely upon, she also got help in writing the book. She asked several other bike touring families to tell what bikes they chose for their tours and why they chose the ones they did. To me, this was the most interesting and helpful section of the book. Most of the other information is available in other resources. It was invaluable information to see that a tour can be done in a variety of ways and individual family circumstances can dictate which is best for them. There is no “one size fits all” solution to choosing bikes and types of tours. There were some great nuggets of wisdom on making your own bike choices. The rest of the information covered in the book are things like where to sleep and what to eat. Those are basic points that needed to be covered, but were not necessarily specific to family bike touring. This book was announced in their newsletter at the same time their other new book was released: What Were We Thinking? 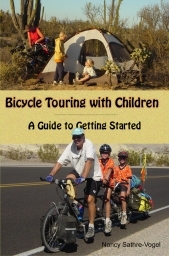 To get the Bicycle Touring with Children book you can sign up for their newsletter and download the book.